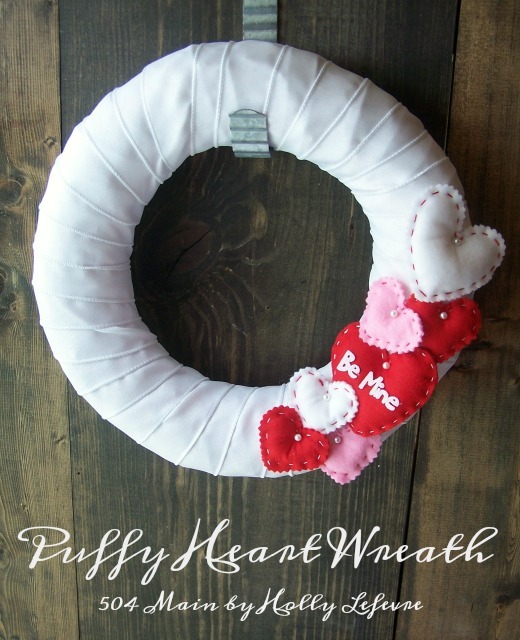 Since we are almost out of time, grab your coupon and head to Michaels and pick up this package of puffy hearts TODAY! 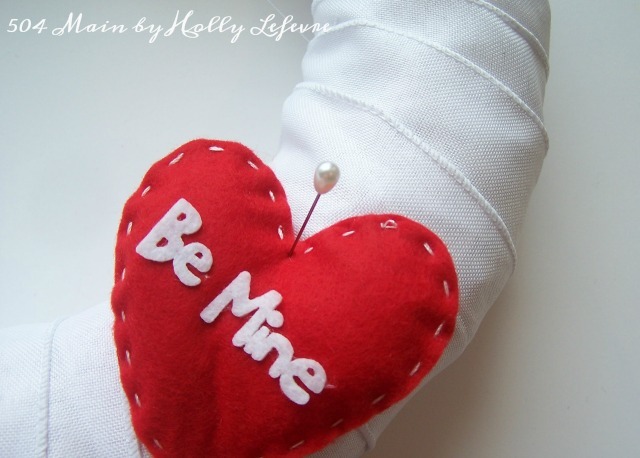 I will use the hearts in a craft tomorrow too! 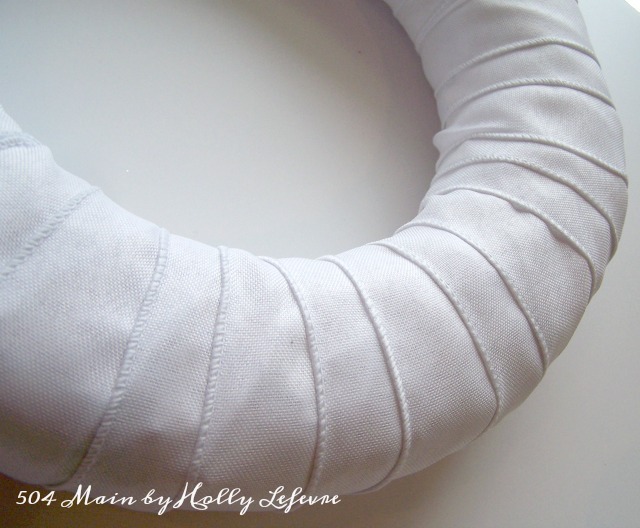 I used Celebrate It white wired ribbon, 2.5" wide. I used almost the entire role. Because the color is so light, I overlapped my ribbon more than usual and therefore it required almost the entire role of ribbon. The process is similar to my Halloween wreath and Tinsel Wreath. 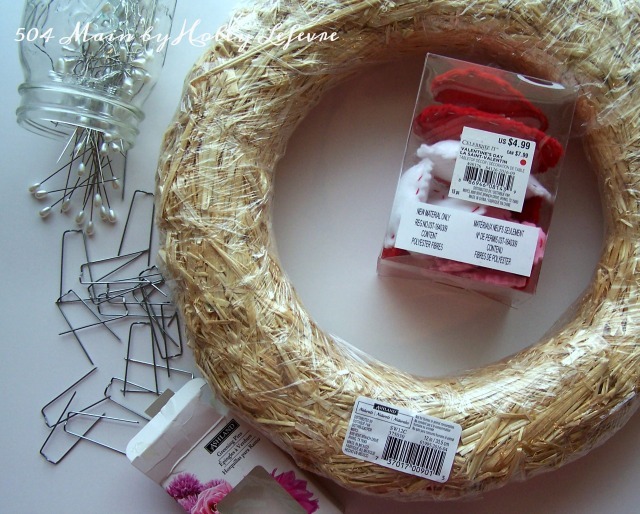 Begin with your wreath and length of ribbon. Use the greening pin (place it in the center) or 2-3 pearl floral pins (place on on each side and one in the center) to secure the end of the ribbon to the wreath. Begin wrapping the ribbon around the wreath, overlapping about half of the ribbon on each wrap (again, because the color is so light, I overlapped my ribbon more than usual). 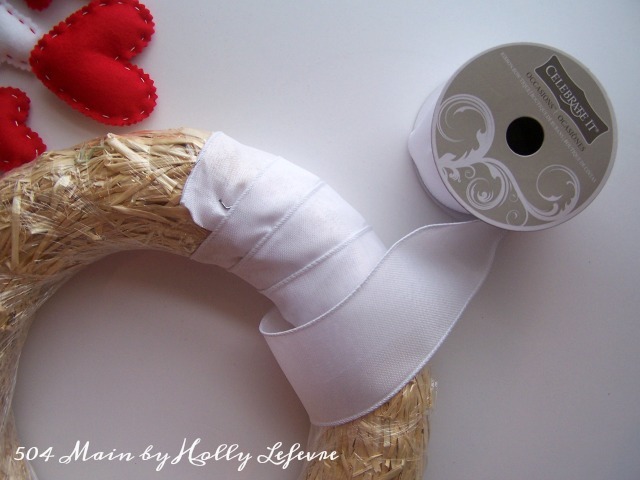 When you get to the end, cut the ribbon, leaving a bit of room to fold over about 1" for a clean edge (and make sure it is on the same side as the side you began on), secure the ending ribbon with the floral pins or greening pin as you did when you began. Place your hearts. You can place them on the right or left, top or bottom. I tend to like a more asymmetrical look, and placed them accordingly. 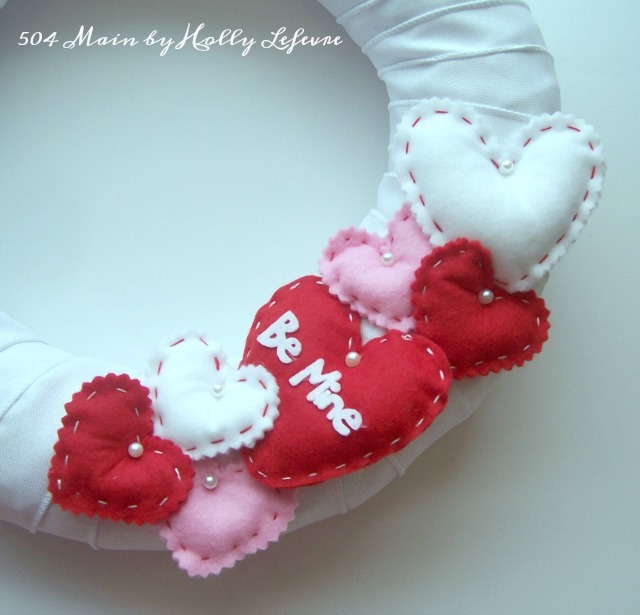 I began with the larger "Be Mine" heart and then added hearts as I liked. NOTE: At first I was going to hot glue these hearts on, but decided to try it with the pearl floral pin...and LOVED it! And better yet, you can remove the hearts and reuse them if you want! I used 2 large hearts (1 white and 1 red) and 5 small hearts (2 pink, 2 red, and 1 white). And look at that you are done and it is so cute! 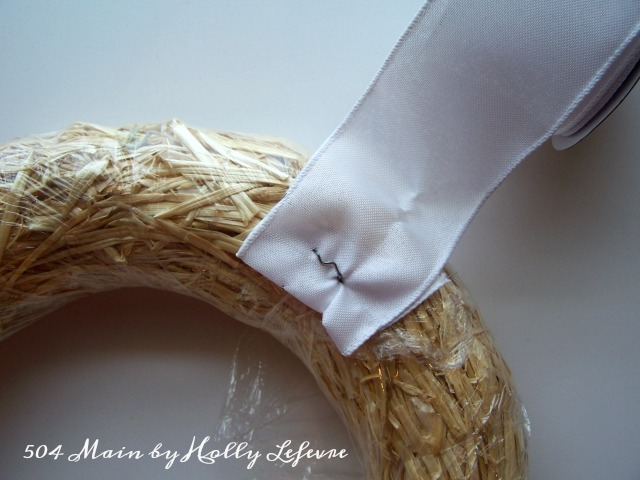 I used a wreath hanger but if you want secure another length of ribbon to the wreath and hang it from there. Now, go on, grab a coupon and head to the craft store! 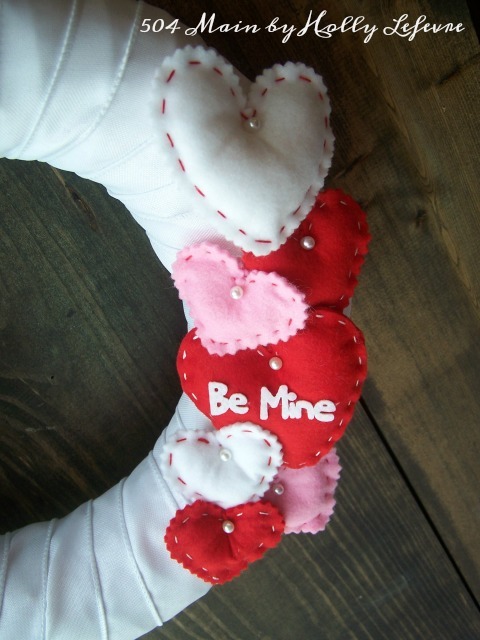 And come back tomorrow...another craft using these cute hearts!